Two of my favorite things in the world recently collided in the most delicious way. Beer and chocolate. As a Featured Publisher for Foodbuzz I got the chance to develop a recipe using beer from The New Belgium Brewing Company. * I have been a beer drinker since I was 18 years old of the legal drinking age of 21. I had seen Fat Tire Ale in the store, but had never had any. I am so glad I was able to participate in this program, because I have discovered a new favorite amber ale to enjoy! If you notice in the picture that bottle is empty! I was able to at least save an empty bottle for the photography, because I enjoyed the ale so much I barely saved a beer for the cake! I had tasted chocolate cakes made with stout before, which is a much darker, deeper brew than ale. 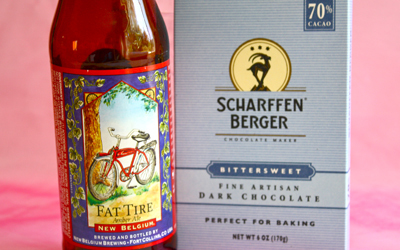 But after tasting the Fat Tire Amber Ale, which has a clean, nutty and rich flavor I wanted to try baking it in a cake. The key was to add another deep flavor to the cake, which I did with powdered espresso powder and a good bittersweet chocolate. This cake is rich, moist and incredibly good! It does not taste like beer, but there is a richness from the alcohol discernable when you taste it. 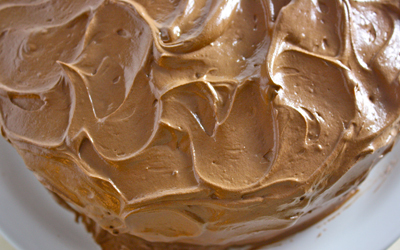 The cake is iced with a smooth and sweet frosting made with the same bittersweet chocolate used to make the cake. 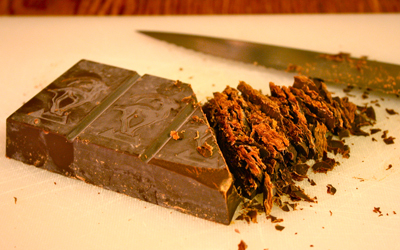 A quick tip to make chopping chocolate easier is to use a serrated knife. A winning combination of two of my favorite things, beer and chocolate! In a medium size bowl, whisk together the flour, espresso powder, baking powder, baking soda and salt. Set aside. Melt the chopped chocolate in the microwave, or in a bowl over simmering water. Let the chocolate cool slightly. In an electric mixer on medium speed, cream the butter and sugar 2-3 minutes, until well mixed. Add the eggs one at a time, being sure to mix well before adding another. Add the cooled chocolate to the mixer, making sure to scrape down to bowl and mixing well. On low speed add the amber ale, and mix just until the beer is incorporated.Add the dry ingredients slowly and beat the batter just until mixed well. Scrape down the bowl as needed. Divide the batter between two 9″ round cake pan, which have been buttered and floured. You can also place a buttered and floured piece of parchment in the pan to help prevent the cake from sticking. Bake the cakes in a preheated 350 degree oven for 25-30 minutes, or until a toothpick inserted into the center of the cake comes out clean. Cool the cakes on a rack for 20 minutes, then invert onto the rack to continue cooling.When completely cooled, frost the cakes with Bittersweet Chocolate Frosting. 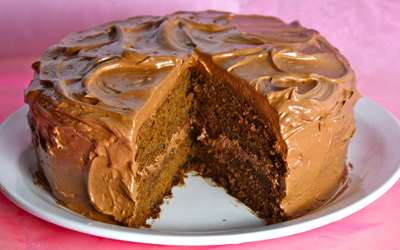 This chocolate icing is delicious on any kind of chocolate cake. Smooth, sweet and rich – Just try not to eat it all before it gets onto the cake! You’ll be licking the spatula before you even frost the cake! In an electric mixer cream the butter and sugar for 2-3 minutes, until well mixed. Add the cocoa powder and beat for an additional minute. Add the vanilla extract and melted chocolate, and mix for a minute until well combined. On medium speed, beat the icing for 4-5 minutes, until light and fluffy. Frost the cooled cake with the icing. * The New Belgium Brewing Company is giving me with a monetary stipend for developing this recipe. Any and all opinions expressed are my own and are not influenced in any way by the manufacturer/PR firm. My first question to you would be, how long did you bake it for? I cannot go by look when I bake, which I learned the hard way. I have over baked or under baked a few items in my time! I always follow the recommended bake times on a recipe, usually checking a little before the earliest time, in case my oven runs hot. Generally, if I am not going to ice a cake as soon as it is cooled, I make sure to wrap the layers in plastic to avoid them drying out. Cakes do dry easily, so that may have happened, even though it was under the cake dome. Please let me know how your second attempt works. And on the stewed tomatoes with potatoes topic, I have never heard of that dish before! Interesting! I made the cake on Thanksgiving day. The batter tasted very good, and it smelled wonderful while baking. When I removed from the oven it looked great. I let it cool as instructed first in the pan, then on a rack. I couldn’t put the icing righ away, so I put it in a glass cake dish. That is when the good ends and the not so good begins. The cake was ‘iced’ the next evening by hubby. I didn’t have a chance to taste it due to family emergency. He said the flavor was good but the cake was dry. HELP please. What did I do wrong. When it started ‘pulling’ away from th side of the cake pan, I took it out of oven. It ‘felt’ moist when I touched the top when it first came out of the oven. If I over mix, would that cause it to be dry? I didn’t think I left in in the oven too long. I want to try again this week. I co-worker sent me 2 bottles of New Belgium (he is in CO, I am in OH.) Will waiting a day to ice a cake also cause it to taste dry. Different topic. I am remembering a friend’s mother who made stew tomatoes with potatoes. She was from SC, if any help. There is no one I have ever spoken w/ who know what I am talking about. I have found a couple of recipies on line, but the were anywhere near to what she made. There wasn’t any sause on the potatoes. They looked a little red, similar to what a can of stewed tomatoes look like. Have you had anything like this. This is something I had almost 40 years ago, so my memory is a bit foggy. Look for an amber ale in your local store. Ask the people who work there which amber ale they like, and you will probably get one that will work in the cake. It’s more about using a beer that is medium dark, with rich deep flavors. Fat Tire happens to be one that is really delicious! But there are others out there. HELP PLEASE, where I live the closest place that sells Fat Tire Ale is almost 5 hours away. Can you recommend another ale that is comparable to Fat Tire? I want to try this before Thanksgiving. I am not a beer or ale drinker so I don’t want to pick just anything. I will be able to get it when I am in Philly for Christmas, and will have a chance to make it again while I am there. My need is to have this cake on my Thanksgiving table though. Booze AND chocolate? Yep, you got my attention! This looks absolutely divine. I wish we would have had a chance to chat at Camp Blogaway, but I look forward to getting to know you better through your wonderful recipes and stories here. We’ll have to make that meeting happen Stacy! Your husband will love this cake, and so will you, even if you don’t like beer! I checked out your blog before camp and was looking forward to meeting you, but I never managed to sit with you which I find quite disappointing. I give myself a demerit, and a challenge to meet you soon! most certainly a must try! love belgium beer and ales. My mouth is watering and not only because it’s a hot day and that beer looks good, but because I really wish I had a GIANT piece of chocolate cake. I love how you swirled the frosting, I miss seeing cakes look like that, you know the “old fashioned” way. LOL! I wish we talked more at camp, you are so funny! It was great to meet you also. And the cake is to die for! I love this recipe! A keeper for my recipe files. Yum! Love chocolate and beer but don’t bake – hmmm, I need to enlist someone to make this for me! Oooh that cake looks so rich and moist. What a fun tastemaker opportunity too. 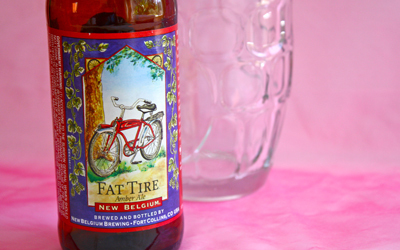 I love New Belgium beers, Fat Tire used to be my favorite!